Students at Mt. Edgecumbe High School sometimes can feel trapped at the school. A new bike check-out program is giving those students a chance to have a little bit of freedom as they head to downtown Sitka. For those who haven’t been to Sitka before, a little explaining is in order. Mt. Edgecumbe High School is a state-run boarding school and most of the 400-430 students are from small villages around the state. They come to Sitka to have access to classes they might not be able to get at home. The Mt. Edgecumbe High School campus is located on Japonski Island, across the O’Connell Bridge from Sitka on Baranof Island. It’s not really that far, about a mile or two, but sometimes that can be a little too far to walk, especially if you have to be back in the dorms by a certain time. Anyway, the school had several older bikes that had been collected over the years. But they were in poor repair and many of them weren’t safe to ride. Mt. Edgecumbe High School partnered with the SouthEast Alaska Regional Health Consortium (SEARHC) Health Promotion and Injury Prevention programs and with Island Fever Diving and Adventures/Sitka Bike and Hike to get the bikes fixed up and safe for students to check out. Island Fever Diving and Adventures, which also operates the Sitka Bike and Hike company that provides bike tours, repairs and sales, performed maintenance and safety checks on all the bikes. SEARHC Health Educator Doug Osborne, a League Certified Instructor by the League of American Bicyclists and a key member of the Sitka Bicycle Friendly Community Coalition that helped Sitka become Alaska’s first official Bicycle Friendly Community, gives bike safety instruction to the students. SEARHC is the tribal health organization for the region and it operates the Mt. Edgecumbe High School Student Health Center as one of its clinics. Osborne said he was happy to partner on this project because it gave SEARHC a chance to promote healthy physical activity and injury prevention to the students. Even though the weather is getting somewhat nasty as winter approaches, the students still were checking out the bikes in November. Because Mt. Edgecumbe High School is a boarding school, classes run later in the day than they do at Sitka High School across town, and Mt. Edgecumbe High School sometimes has Saturday classes. Many of the stores in Sitka close by 5-5:30 p.m. on weekdays, earlier on the weekend. 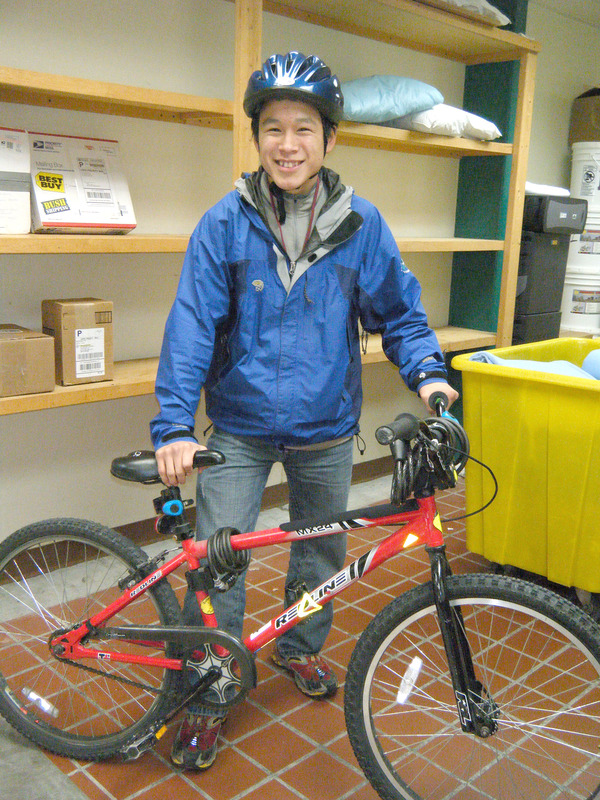 “I have a really tight schedule every week, but having a bike to check out gives me the opportunity to go to town and back very quickly,” said sophomore Nelson Kanuk, who came to Sitka from the tiny Yup’ik Eskimo village of Kipnuk in the Yukon-Kuskokwim Delta region of Southwest Alaska.